As everyone knows, tickets to the Walt Disney World Theme Parks aren't cheap. It is important to take advantage of any tips and tricks in order to make the most of your time in the parks. 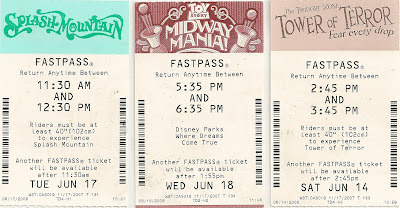 Today I am going to talk about the Disney feature called the "FASTPASS". Walt Disney World introduced the FASTPASSes as a free way for park visitors to reduce the amount of time that they spend in line. They are a wonderful feature and something that you should be planning to take full advantage of during your next visit. In each park the most popular rides (i.e. Test Track, Soarin', Expedition Everest, Kilimanjaro Safari, Space Mountain, Splash Mountain, Tower of Terror, Toy Story Mania, etc.) have special areas next to the attraction entrance in which you can obtain a FASTPASS. To get the FASTPASS, you must put your Park Ticket into the reader and then you will be issued a FASTPASS (like the ones shown above). You can receive one FASTPASS at a time per park ticket. It will tell you on the FASTPASS when you are eligible to get another one. The FASTPASS also has a time range stamped on it. This is the time that you can return to this attraction to get into the special FASTPASS Only line. The FASTPASS line is designed to have no or significantly reduced wait time. You will get to pass people who are waiting in the normal standby queue. After you get in the special line you will ride/experience the attraction just like everyone else. By using the FASTPASS you can avoid the long waits that some rides will have and spend your time visiting other attractions until your FASTPASS time arrives. This really takes the stress out of your day. So the next time you visit Walt Disney World, look for the FASTPASS designations for your favorite attractions and use this free benefit to help you have a magical day! 0 comments to "FASTPASS - the Ticket to Maximizing Your Fun at Walt Disney World"